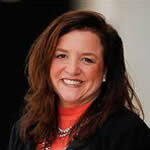 Cloud Computing — Friend or Foe for Channel Partners? There has been much conversation lately and increasing buzz around cloud solutions bypassing channel partners, and enterprises working directly with the vendors and service providers. We all know cloud mandates a tremendous change in the skills of an internal team and the IT department. In fact, this is a primary reason why partners (if you have the right skillsets) will absolutely play a critical role in the enterprise digital transformation to cloud. Nowadays, enterprise companies working with cloud solutions have some direct relationship with the cloud vendor – but most often this is and should be in tandem with a business partner. 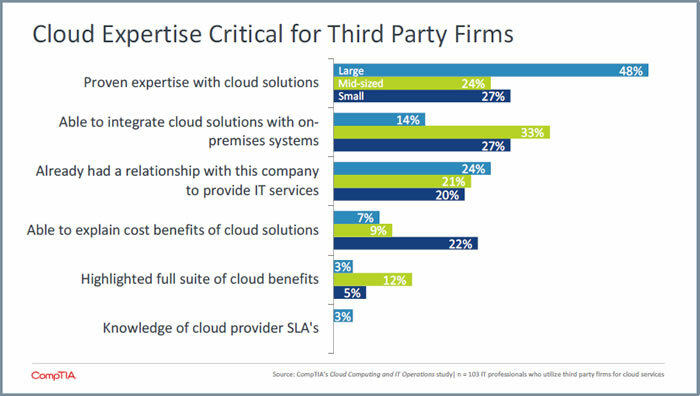 Whether they're the primary source of cloud services or third-party partnerships, the vendor and partner relationships are increasingly important for the enterprise firm's success. It's not the old days of enterprises simply procuring from the data center service provider a required pipe. Cloud brings technology, business process, and ROI complexity, IT internal skill gaps and even organization conflict within the enterprise. It's for this very reason that the business partners who focus with a more holistic approach can add tremendous value to this paradigm. 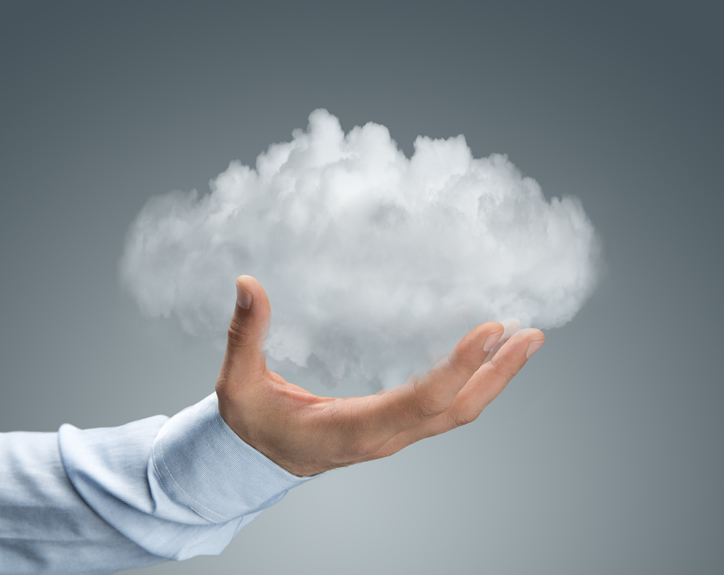 The increased tendency to source cloud solutions (whether that's backup or SaaS applications) directly from the vendor has caused incredible concern and tension with many channel partners. However, AchieveUnite and CompTIA believe sourcing the product is only the first step in a cloud solution. Large companies will increasingly rely on their best channel partners to assist IT and the business units with digital transformation and new application integrations. There are many cloud-related success and transformation activities related to cloud operations that companies often require. 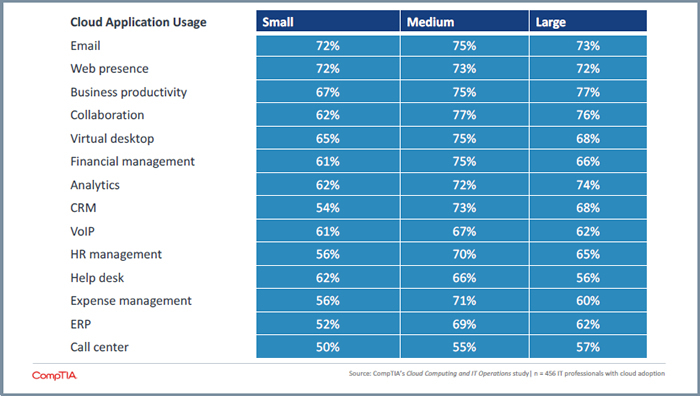 Below is the top list of cloud applications according to CompTIA's Summer 2018 new cloud study. Based on CompTIA's survey, the #1 reason for a company to leverage partners is the partners' proven expertise with cloud solutions. #2 reason is the ability for a partner to integrate cloud solutions with on-premise systems (see the full set of required skills below). It's also clear through our research that businesses are finding their existing partners may not have the level of expertise they require. Consequently, channel partners, including solution providers, MSPs and technical service firms, must ensure they pursue and develop new skills to ensure they maintain a competitive edge in cloud. Increasingly, the channel partners can add value by offering customization or optimization of applications in cloud environments. Cloud computing can introduce disruption and new hurdles. Integration remains the primary challenge, but workflow modification and policy (the other two) highlight organizational issues that follow initial technical efforts. It's imperative for channel partners to develop their business, process and organizational support competencies and skills. A partner helps a smaller company improve its implementation. A partner helps a mid-sized firm modernize its IT environment. A partner helps a large enterprises streamline their processes with the assistance of the channel partners' best practices and knowledge. Cloud computing remains the key enabler for emerging technology. Eighty-one percent of companies say that cloud has greatly or moderately enhanced their efforts around automation. The rising interest in cutting-edge trends is driven largely by cloud computing. Achieve Unite and CompTIA recommend channel partners must increase their competitive edge in this space in order to be successful in their business long term.